Lady Tug is very clean with low hours and has all the options. Cummins 450 hp Diesel (1326hrs), 12KW generator,flybridge and lower helm, 3 zone air conditioning, bow and stern thrusters, 2 private staterooms with full heads, full electronics, newer dinghy, motor and crane, new teak in the wheel house and everything works! Why buy new? Please see the full specifications for additional information and photos. She is being offered by her original owner due to a change in her plans. She comes with the slip paid for summer 2018 at our upscale marina in Rhode Island where there is no sales tax. Overseas shipping is easily arranged from Newport or Providence. 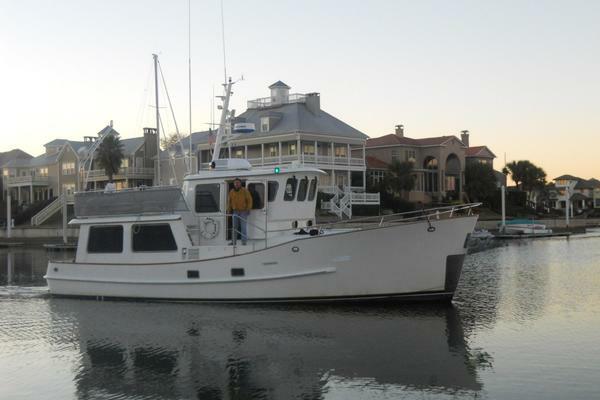 Call for an appointment to see this wonderful vessel and ask about slip and storage discounts being offered with her. Custom Teak valance, drapes, curtains and bedcovering. Custom high low table in salon.